Since the very beginning, our country has been led to success and freedom by some of the strongest people in history. 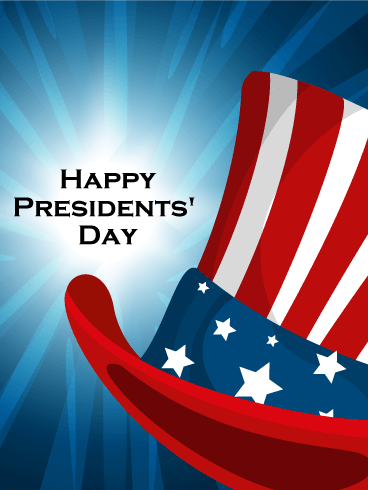 This Presidents' Day, remember the sacrifices and guidance given by America's leaders with a Happy Presidents' Day card. 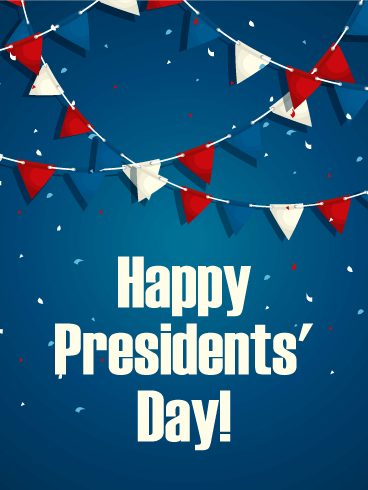 With the patriotic colors and theme, this Happy Presidents' Day card will help your friends and family celebrate and enjoy this holiday. For over 200 years, America's leaders have kept our homes, lives, and freedoms safe from those who would take them away. Celebrate the lives of these great men by sending a Happy Presidents' Day card to everyone you know! The red, white, and blue decorations will put them in a patriotic spirit and show your excitement for this holiday! Send it today! 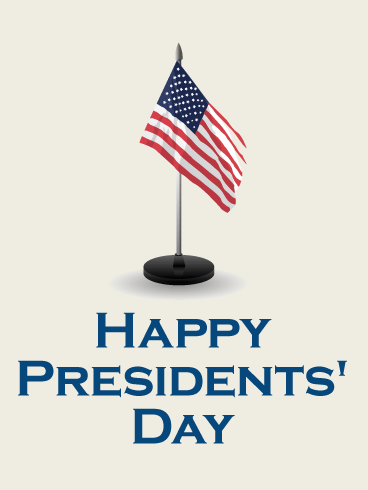 It can be tricky to find a good President's Day card-or any President's Day card at all. Look no further than this elegant card. The gold star encompassing the American flag is the center focus, while the font of the words adds a bit of fun and sophistication. This is a great choice for anyone in your life celebrating this President's Day. Everything about this President's Day card is sure to make it stand out. It's the perfect balance of simplicity and fun, making it a great choice for the person in your life who enjoys celebrating President's Day. The red, white, and blue striped and starred hat adds a bit of flair, while the bright colored background really makes this birthday card pop. There's no need to fret over finding the perfect President's Day card anymore. For the patriotic person in your life, this card is a great way to wish them a happy and meaningful President's Day. The red, white, and blue add the necessary patriotic element, while the three-dimensional stars add a fun element. Three cheers for the Red, White, and Blue! 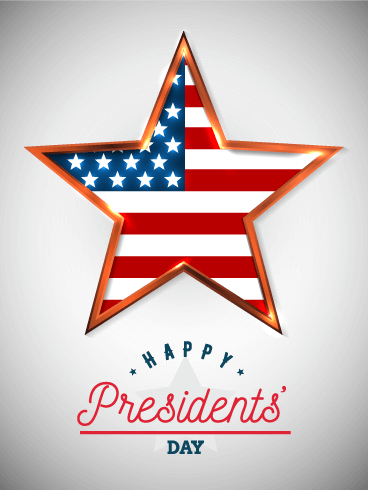 Celebrate Presidents' Day in style when you share this patriotic greeting card. The stars and stripes remind us of our national pride and heritage. 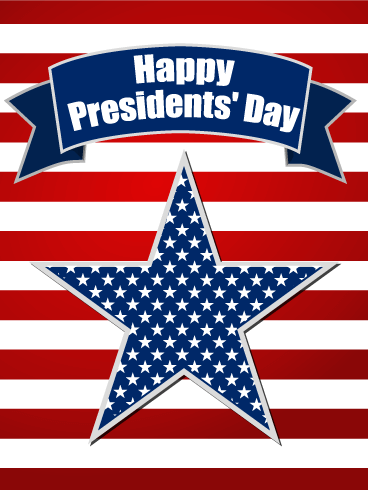 Wish someone a happy Presidents' Day and send this patriotic card. It's a great nod to our forefathers and the work they did to establish this great nation. 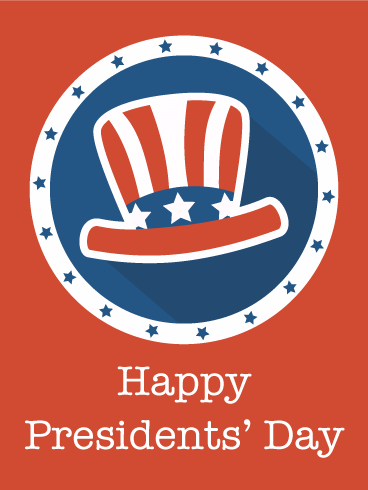 Make Uncle Sam proud and send a Presidents' Day card to your friends! 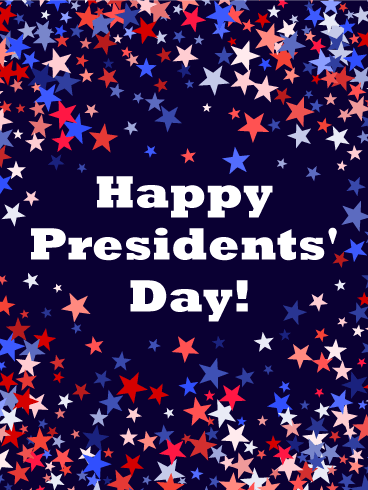 Take a moment to remember George Washington, Thomas Jefferson, and Abraham Lincoln-some of the greats who made this country strong. Feeling patriotic? 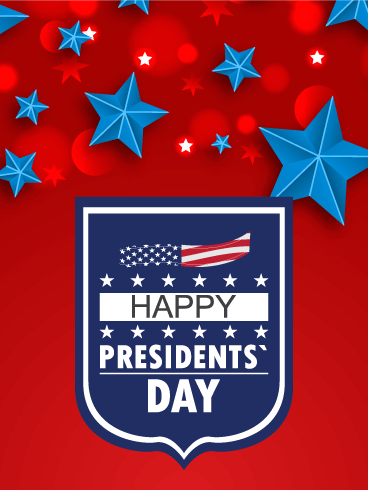 Celebrate Presidents' Day with this American card in red, white, and blue and send it to friends, family, or co-workers. This is a great greeting card for anyone proud to be an American. We are the Land of the Free, and the Home of the Brave. 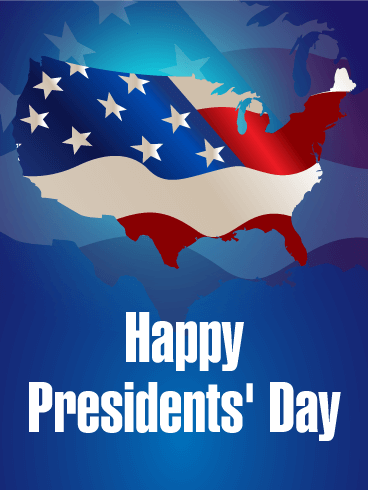 Why not send a Presidents' Day greeting card to someone and celebrate the sacrifice of our forefathers? It's a great day to be proud to be an American and reflect on the vision and dedication of those who came before us. This Presidents' Day card has a beautiful American flag waving through the outline of the United States. Oh, she's a grand old flag! Send this high-flyin' American flag greeting card to celebrate Presidents' Day. The big star in the center is filled with the stars that represent the 50 states of America, and it shines over a the red and white stripes of the flag. It's a beautiful and patriotic greeting card that is perfect for anyone proud to be an American and happy to celebrate all the great Presidents who have selflessly served the U.S.A.
From Sea to shining Sea, we're united and we're proud to be Americans. 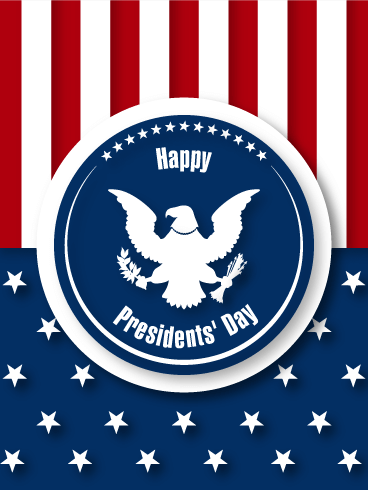 Celebrate the history and heart of this great nation on Presidents' Day with a simple and patriotic greeting card. The stars and stripes wave proudly in the background and say all that needs to be said. Our flag reminds us of where we came from, who we are, and who we always hope and strive to be. Wish a happy Presidents' Day and send this thoughtful card.